Family Euphorbiaceae, genus Euphorbia L. There are 202 species of spurges in the former USSR. Tithymalus helioscopius (L.) Scop., Galarhoeus helioscopius (L.) Haw. Plants contain white lacteal juice. Root is thin and cylindrical. Stalks are green or reddish, upright or prostrate, simple or ramified, single or numerous, (5)10-35(50) cm long, 1-4 mm thick, having scars at base where the leaves have fallen, glabrous or sparsely hairy in the upper part. Phyllotaxy is alternate. Leaves soft, without stipules. Stem leaves are 2.5 cm long, 0.5-1.5 cm wide, obovate or oblanceolate, glabrous. Leaves are broadened toward apex, narrowed toward petiole base, with the greatest width in distal third. Leaf apices are rounded, finely toothed or serrated. The lower leaves are smaller. Inflorescences are umbellate; they consist of five main apical rays, each one is 0.5-4 (8) cm long. Each main ray branches into 3 secondary rays, which in turn branch into 2 tertiary rays. Flowers are small, inconspicuous, unisexual and greenish-yellow. They are also aggregated in complex inflorescences. The latter includes some male flowers consisting of a single stamen and one female flower with an ovary. Pistillate female flower and staminate male flowers are wrapped by cup-shaped involucres having lobes and glands (nectaries). Involucres leaflets look like stem leaves, 0.7-2.5 cm wide and 1-3 cm long. Three lower bracts are similar in shape to upper stem leaves. Two upper bracts are rounded or elliptic. Involucre is campaniform, 1.5-2.5 mm in diameter, glabrous from the outside, fluffy inside, with oblong fringed lobes. Glands (nectaries) are transverse-elliptic, greenish, 4 in number. Columns are 0.8-1 mm long, almost free, bifid (accrete in approximately 1/6 basal part, dissected in almost 2/5 apical part). Fruit is ovoid three-cell nutlet, 2.0-3.5 mm long, 3-4 mm wide, deeply three-striated, smooth, yellow-gray. Seeds are 1.5-2 mm long, ovoid, cellular-reticulate (cells are divided by sharp thin septa), compressed and pointed at apex, with discoid appendage. Fresh seeds are gray-green and stale (old) seeds are brown or dark brown. Length of seeds is 1.9-2.5 mm, their width is about 1.9 mm. Average weight of 1 seed is 2.5 mg. 1000 seeds weigh about 2.5 g. Blossoming occurs from March until June. Fructifying occurs in June-July. The species was described from European cultivated lands. Its type is deposited in London. General distribution includes the south of Scandinavia, Middle and Southern Europe, the Mediterranean, the Balkans, Asia Minor, Armenia, Kurdistan, Iran, India, the Himalayas, Japan, China, Northern Africa. It is an adventive plant in North America. In the territory of the former USSR the species is distributed in the European part, Crimea, the Caucasus, Central Asia (Syr-Darya, Pamiro-Alaya, Mountain-Turkmen and Amu-Darya areas, sparsely in Southern Kazakhstan). It is also sparsely distributed in Western Siberia (in the Tyumen, Tobolsk, Kurgan, and Novosibirsk areas). In nature the plant grows on grassy hillsides of the Caucasus and Central Asia. Nikitin (1957) characterizes the spurge as a .non-resistant to heat ephemeron.. In the southern part of its area the spurge litters irrigation fields of Lucerne and grain crops, less often vegetable crops. It occurs frequently, but with low abundance. The plant also litters tilled crops and spring grain in all areas. For example, the weed litters 7% of fields in the zone of broad-leaved forest, 2.3% in the zone of broad-leaved-spruce forest, 1% in the zone of southern taiga (Shlyakova, 1982). The species occurrence decreases northward. 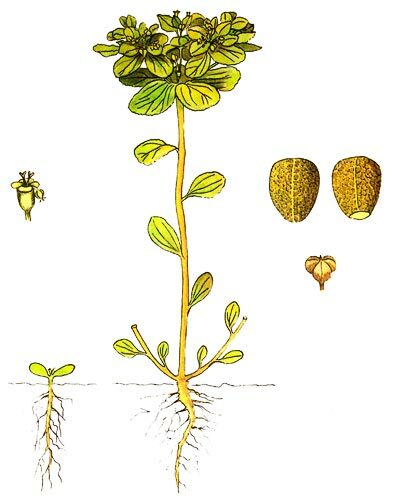 Nikitin (1983) did not name this spurge as a malicious or main weed as its abundance usually does not exceed 3 points according to Maltsev's scale. Nevertheless, the plant is a widespread and noxious weed of crops grown from the zone of broad-leaved forests to the southern borders of the former USSR. The species is also found in anthropogenic landscapes, i.e., in ruderal and garbage places, for example, along roads and railways, and on fallow lands. Lacteal juice of the spurge contains a small amount of rubber, and consequently the spurge is not eaten by cattle. The spurge also contains .euphorbon., a poisonous substance which causes burning of the mouth, tumor of the tongue, gastro enteric pains, dizziness, breakdown, and even death. Juice can cause skin ulcers. Control measures are the same as for any annual weed and consist of the combination of agronomical and chemical control measures.